Philadelphia, PA (November 28, 2008) – Joseph Manko, a founding partner, and Rodd Bender, partner with Manko, Gold, Katcher & Fox, LLP in Bala Cynwyd, will speak on "Environmental Impacts on Real Estate: New Developments and Emerging Trends" at the Pennsylvania Bar Institute's (PBI) 12th Annual Real Estate Institute on Thursday, December 4. The two-day program will take place at the Pennsylvania Convention Center, 12th and Arch Streets, Philadelphia. 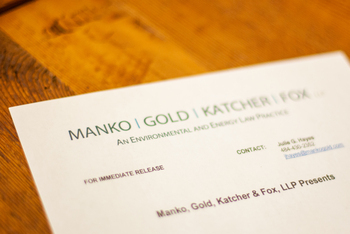 Manko and Bender will address real estate attorneys on environmental impacts on real estate including recent changes to the U.S. Environmental Protection Agency's audit policy benefiting owners of newly acquired facilities, requirements for recording activity and use limitations in brownfield remediations under Pennsylvania's Uniform Environmental Covenants Act, and new developments in stormwater management. They will also provide a glimpse into the future of real estate development, as the issues of climate change and energy independence move to the forefront.